When I was in high school, they split up our junior year (mostly American lit) reading between classes--one class read The Great Gatsby and one class, my class, read The Adventures of Huckleberry Finn. I was slightly bummed at the time because I remember my sister loved The Great Gatsby and at the time, of course, I still idolized my older siblings, but I ended up loving Huck Finn. (there is a probably a life metaphor in there somewhere) I never took the initiative to read The Great Gatsby on my own, but now years later, I have finally read F. Scott Fitzgerald! I read The Beautiful and Damned and it was not necessarily a fun read, but I guess I'm glad I read it since he is considered to be such a great American novelist, etc. The setting for the book is the 1920's? But the book was published in 1922 so maybe a bit before that, the war in the book is the first world war. The Beautiful and Damned is primarily Anthony Patch's story and he is in no way a likable protagonist, there was nothing redeeming about him really, but obviously that wasn't the point. Anthony Patch has enough money to get by, certainly, but what he really wants is his grandfather's inheritance, so he's basically waiting throughout the entire book for his grandfather to die, so he can have this unlimited amount of money to squander on the pursuit of pleasure. He meets Gloria Gilbert, and thinks he falls in love with her. Gloria is beautiful, like the most beautiful girl ever (of course) and Anthony must have her! So when she sort of turns him down at one point, he gets very childish and pretends he doesn't know her for like five weeks in order to make her see the error of her ways...and that's pretty much the story of their relationship. It's hard to believe they really love each other, but rather the idea of each other and the idea that they are young and beautiful and indulging in their greatest passions. But the reality of their relationship is ugly. Gloria clings to the sentimentality of it and Anthony essentially hates her and the hold she has over him, so he's manipulative and abusive and it's just not a lot of fun to read? The book is divided into three sections, the first section being about how Anthony and Gloria meet, fall in love, and get married, the second section is about how their marriage slowly begins to dissolve, and the third section is pretty much about their utter destruction. I feel like the story meanders in some places, I hit the halfway mark and almost gave up. But even so, it's kind of a depressing look at desire. I mean ultimately I feel like it's the satiation of desire in the moment that both characters live for and that ultimately destroys them. Anthony's feelings for Gloria are largely centered around his desire to possess her. "He was not so much in love with Gloria, but mad for her." She is the one thing he really wants in the beginning of the novel and for awhile she remains out of reach for him. An old family friend is also interested in her and that drives Anthony mad with jealousy, but eventually he...wins? And marries Gloria. And it's good times at first, they go on their honeymoon, and rent a house and they are happy and indulging all their inner passions. Only they have serious problems and those come out in the a scene that made me think, "why am I reading this book?" Fitzgerald prefaces the scene with saying it was an incident that stole Gloria's brightness or whatever, but really it was just Anthony being abusive. They were out with friends and Gloria wants to leave but Anthony doesn't and he's annoyed by her insistence that they need to leave. And they argue about whether or not he's drunk, and then comes this gem: "In his mind was but one idea--that Gloria was being selfish, that she was always being selfish and would continue to be unless here and now he asserted himself as her master." They fight and Gloria is miserable, but Anthony thinks, "Ah she might hate him now, but afterward she would admire him for his dominance." It's just really gross, but it does take place approximately halfway through the novel and signifies the turning point in their relationship...things are never quite the same again, while they might find temporary reprieves, whatever trust Gloria had in Anthony is shattered in a way that can never really be repaired. The closest she comes to feeling things for him again is when he goes to war and she's writing him letters overcome with sentiment. But nothing seems to stop Anthony and he continues to work his way to his own destruction. He goes to train in the army for war and self sabotages the opportunities he has there, strikes up an affair with a local girl, and continues to drink. He neglects Gloria until it becomes clear she might be forgetting about him at which point he does everything in his power to try fix things. And that's pretty much the story of Anthony Patch. He doesn't want anything until it's out of reach and then he wants it desperately. He even says at one point, (to the girl he's having an affair with for crying out loud!) "Things are sweeter when they're lost. I know--because once I wanted something and got it. It was the only thing I ever wanted badly, Dot. And when I got it, it turned to dust in my hands. *" Honestly that pretty much sums up the story of Anthony's life! He only ever wants what is just out of reach. Gloria spends the novel preoccupied with her own beauty and its inevitable deterioration. When she thinks at one point in the book she might be pregnant, she's upset over the idea that her body will lose its shape because that is what Anthony loves. She is told again and again how beautiful she is, so when something happens towards the end of the novel to make her feel like she is losing her youth, she's really upset. And there's this weird thing in the beginning I think, where we are supposed to believe that Gloria is beauty itself incarnate. The book wasn't without humor though, sometimes I did just laugh at how ridiculous Anthony was. He never wants to work and at the beginning of the book he thinks that he wants to be an author, but the very thought of having to sit down and try to pour all his thoughts out is off putting. I mean, I could actually recognize some elements of real human behavior in a funny way through some of these stories. And oh the disdain for the middle class! Anthony would rather be poor or rich than middle class. 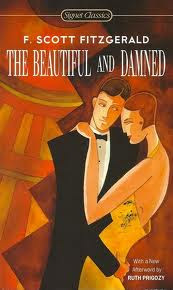 Supposedly The Beautiful and Damned is really closely based on F. Scott Fitzgerald and Zelda. If this is true what depressing lives they had and what a jerk Fitzgerald was! But I do think it's an interesting read if you can bare hating the characters and knowing they will make every wrong choice available to them based on their desires in the moment. As you might guess, there's no happy ending in that. And I suppose there's still quite a bit of a cautionary tale in it. Also I was looking at some reviews and I saw someone say the characters are really complex and so is their relationship. And I don't quite agree with that because I felt like I understood everything about their driving motivations and how they related to each other, and I don't know if that's because Fitzgerald painted them so well or if it's just because it all boiled down to selfishness. I read this book because the show Gossip Girl wove the book into their framework as a reference point for the characterization of Serena. I'm a sucker for shows that do this (hello Lost) and it was actually pretty illuminating. I will talk more about that tomorrow, but don't you think it's fascinating how stories build upon stories and no story exists in isolation? It makes me wish I could read more books and consume more stories, but alas I am only one person, I must rely on others to do a lot of it for me! *Okay so this reminded me of a line in a Cure song, "A Letter to Elise" so I looked up the song just for fun and discovered is actually does have literary influence in the form of Letters to Felice by Kafka!